Background: From thickets of blazing yellow-gold aspens on its slpes in fall to showy spring wildflower displays on the rolling meadows. Hope Valley is known for its stunning scenery and serenity. It is also a good place to see wildlife for those who take time to look. Mule deer and yellow-bellied marmots use the area from spring through fall. During spring listen for blue grouse booming and mountain quail whistling among the Jeffrey pines and near creeks. When near water look for common snipe or locate them by their winnowing calls. Many cavity-nesting birds also inhabit the conifers and aspens, including red-naped sapsuckers, hairy woodpeckers, and mountain bluebirds. Fall populations of warbling vireos, western wood pewees, and yellow-rumped warblers give way to such winter visitors as red-breasted nuthatches, mountain chicadees, and dark-eyed juncos. Clark's nutcrackers are common. Belding's ground squirrels and other rodents attract a variety of hawks, porcupines, coyotes, bobcats, and black bears also inhabit the area. Watch for beaver sign and spotted sandpipers near the Carson River. The Pony Express Trail, Mormon Emigrant Trail and the historic Danberg Camp are located on the area. The Habitat: Wet meadow (20%), Mixed Conifer(30%), Riparian (10%), aspen (20%), bitterbrush, sagebrush (10%) and willow (10%). The Experience: The vegetative mosaic provides diverse wildlife viewing opportunities. Habitat for special status species includes willow flycatcher, goshawk, peregrine falcon, great gray owl, and Sierra Nevada red fox. Species that have been seen are osprey, bald eagle, prairie falcon, goshawk, bear, deer, songbirds and many other species. Wildlife and Where to Find It: Hiking, horseback and mountain biking on trails mainly. Trails are old roads that are closed to motorized vehicles. They rate from easy to difficult. Viewing Tips: Deer, good viewing summer and fall. Information kiosk located at Highway88/89 junction. Mornings and late afternoons best for viewing. Aspens in fall color during October. Carry snow chains during winter. Camping on adjacent USFS land. Call Ranger Station (702) 882-2766 for information. Site Notes: Hope Valley is surrounded by snow-covered alpine peaks. The large meadow with its meandering trout-filled river provides habitat for shorebirds, osprey, bald eagles and other species. In the winter, the area provides easy to moderate trails for cross country skiing or snowshowing in peaceful meadows and forest habitats. 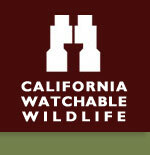 Nearby Viewing Sites: Kirkwood ski area, Red Lake Wildlife Area, Indian Creek Reservoir, Grover Hot Springs State Park http://www.parks.ca.gov/?page_id=508, Mokelumne Wilderness Area and Blue Lakes. Parking Notes: There are some undeveloped pullouts along the highways and a parking lot at the intersection of Highways 88 and 89. How to Get There: At Meyers and the junction of Highways 50 and 89, go south on Highway 89 for 10 miles to Highway 88. Park on south side at junction.